Capture the Chicago skyline light up the night sky as it's skyscrapers glow in magical holiday lights displays! 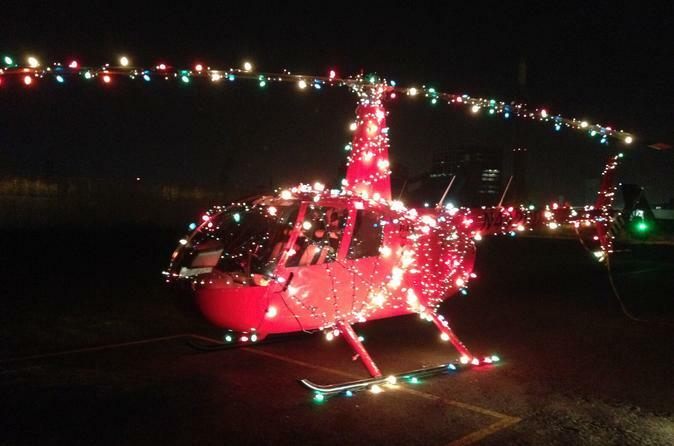 The holiday lights helicopter tour is narrated by the expert pilots, chronicling the history from the times of Fort Dearborn to today. The helicopter departs, first passing US Cellular field and McCormick Place out over the Great Lake Michigan. Prepare to be wowed by the cityscape aglow on the approach to downtown Chicago. Next see the illuminated Navy Pier jutting off the shoreline. Capture the colorful lights from the magnificent skyscrapers reflecting onto the Chicago River. The tour extends up the coastline to view Chicago's famous Lincoln Park Zoo Lights festival, Lakeview, and historic Wrigley Field. After a slight turn, behold the holiday lights display of Chicago’s Magnificent Mile. Floating past the Willis Tower to get one last view of sparkling Millennium Park Soldier Field. The tour will return where it began at the heliport, and a keepsake printed photograph will be available for purchase.